Dohnanyi brought the right combination of muscle and warmth to these performances. The orchestra is first-rate. The sound is excellent. The 4th symphony in this series is also superb. 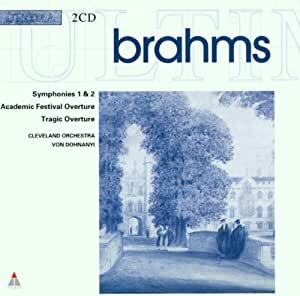 We are fortunate that Christoph von Dohnányi elected to record all four Brahms symphonies while with the Cleveland Orchestra. von Dohnányi is able to further the Cleveland sound and precision into his own straightforward (read uncluttered) approach to the huge demands that these works require. And the results are superb. von Dohnányi understands how to pace the Symphony No. 1 in C minor to make each of the four movements build to the ultimate climax that not only crowns the work, but also recalls the years of struggle Brahms endured to bring his first symphony to life. The elements of hesitancy are here but they so readily give way to the crowning moments of melody and drama that make this symphony so immensely moving. The Cleveland Orchestra is in peak form with superb first desk playing and wind and brass ensemble work. But it remains von Dohnányi's sensitive overview of the symphony as a whole that gives this performance the power it enjoys.